Dambulla Golden Cave Temple., - Dambulla. - Locations in Sri Lanka. Golden Temple of Dambulla is a World Heritage Site (1991) in Sri Lanka, situated in the central part of the country. This site is situated 148 km east of Colombo and 72 km north of Kandy. It is the largest and best-preserved cave temple complex in Sri Lanka. The rock towers 160 m over the surrounding plains.There are more than 80 documented caves in the surrounding area. Major attractions are spread over 5 caves, which contain statues and paintings. These paintings and statues are related to Lord Buddha and his life. There total of 153 Buddha statues, 3 statues of Sri Lankan kings and 4 statues of gods and goddesses. The latter include two statues of Hindu gods, the god Vishnu and the god Ganesh. The murals cover an area of 2,100 square metres. Depictions on the walls of the caves include the temptation by the demon Mara, and Buddha's first sermon. Prehistoric Sri Lankans would have lived in these cave complexes before the arrival of Buddhism in Sri Lanka as there are burial sites with human skeletons about 2700 years old in this area, at Ibbankatuwa near the Dambulla cave complexes.the Dambulla cave complexes. This temple complex dates back to the 1st century BC. It has five caves under a vast overhanging rock, carved with a drip line to keep the interiors dry. In 1938 the architecture was embellished with arched colonnades and gabled entrances. Inside the caves, the ceilings are painted with intricate patterns of religious images following the contours of the rock. There are images of the Lord Buddha and bodhisattvas, as well as various gods and goddesses. 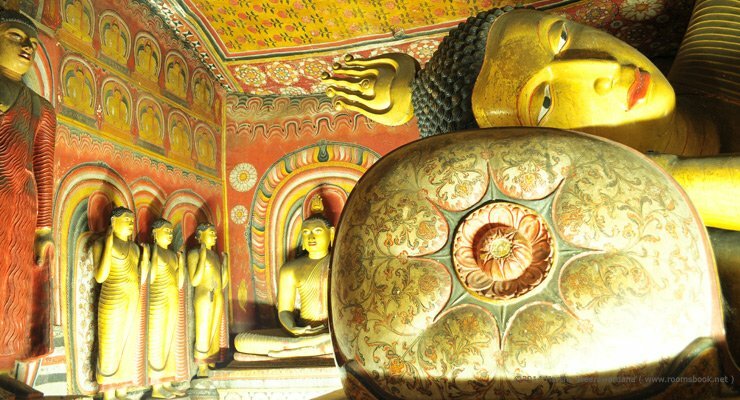 The Dambulla cave monastery is still functional and remains the best-preserved ancient edifice in Sri Lanka. This complex dates from the 3rd and 2nd centuries BC, when it was already established as one of the largest and most important monasteries. King Valagambahu is traditionally thought to have converted the caves into a temple in the 1st century BC. Exiled from Anuradhapura, he sought refuge here from South Indian usurpers for 15 years. After reclaiming his capital, the King built a temple in thankful worship. Many other kings added to it later and by the 11th century, the caves had become a major religious centre and still are. King Nissanka Malla gilded the caves and added about 70 Buddha statues in 1190. During the 18th century, the caves were restored and painted by the Kandyan Kings. The temple is composed of five caves, which have been converted into shrine rooms. 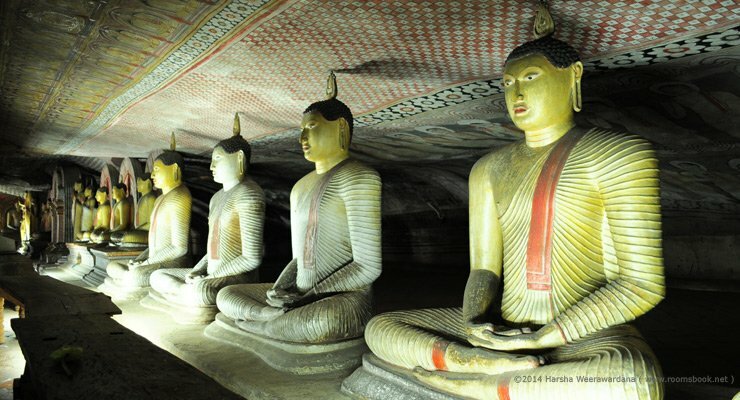 The caves, built at the base of a 150m high rock during the Anuradhapura (1st century BC to 993 AD) and Polonnaruwa times (1073 to 1250), are by far the most impressive of the many cave temples found in Sri Lanka. Access is along the gentle slope of the Dambulla Rock, offering a panoramic view of the surrounding flat lands, which includes the rock fortress Sigiriya, 19 km away. Dusk brings hundreds of swooping swallows to the cave entrance. The largest cave measures about 52m from east to west, and 23m from the entrance to the back, this spectacular cave is 7m tall at its highest point. Hindu deities are also represented here, as are the kings Valagamba and Nissankamalla, and Ananda - the Buddha's most devoted disciple. In the second and largest cave, in addition to 16 standing and 40 seated statues of Buddha, are the gods Saman and Vishnu, which pilgrims often decorate with garlands, and finally statues of King Vattagamani Abhaya, who honored the monastery in the 1st century BC., and King Nissanka Malla, responsible in the 12th century for the gilding of 50 statues, as indicated by a stone inscription near the monastery entrance. This cave is accordingly called Maharaja lena, "Cave of the Great Kings." The Buddha statue hewn out of the rock on the left side of the room is escorted by wooden figures of the Bodhisattvas Maitreya and Avalokiteshvara or Natha. There is also a dagoba and a spring which drips its water, said to have healing powers, out of a crack in the ceiling. Valuable tempera paintings on the cave ceiling dating from the 18th century depict scenes from Buddha's life, from the dream of Mahamaya to temptation by the demon Mara. Further pictures relate important events from the country's history. 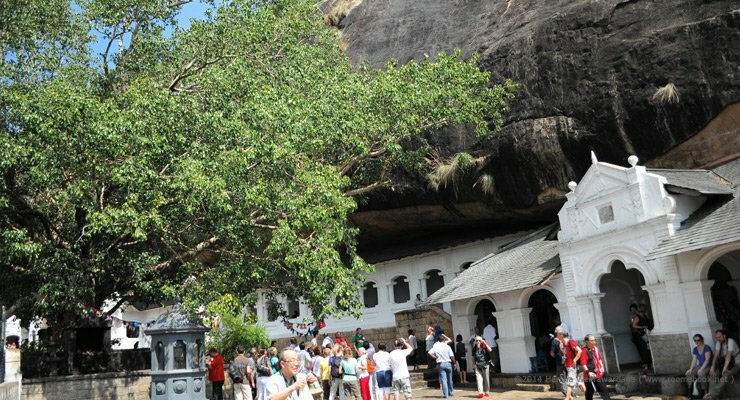 The third cave, the Maha Alut Vihara, the "Great New Monastery" acquired ceiling and wall paintings in the typical Kandy style during the reign of King Kirti Sri Rajasinha (1747–1782), the famous Buddhist revivalist. In addition to the 50 Buddha statues, there is also a statue of the king.